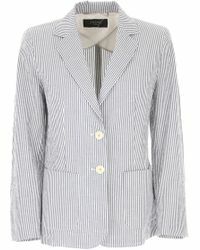 Since it was first established in 1951, Max Mara has grown to be a prominent name in women's luxury fashion. The label has a contemporary, clean aesthetic that is minimal and sophisticated, as well as being often innovative when it comes to defining trends. The brand is well known for its well thought through colour choices, as well as great tailoring and vintage flair. 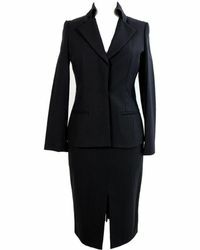 The range of suits from the brand includes belted beige skirt suits and tailored trouser suits with both slim and loose fit trousers. 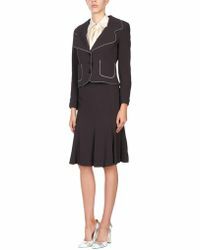 There are unconventional designs too, from peplum skirt suits through to knitted wool suits in dark navy.